Mortice locks have been used in the UK well over 200 years. Mortice locks are usually fitted to (though not exclusively) wooden doors. The standard configuration we see in Edinburgh and the Lothians is a wooden door with a Yale style night latch for convenience and a mortice lock fitted below for security. The mortice Sash-locks have a larger lock-case to accommodate a spring loaded latch bolt (operated by the door handle or knob) and a deadbolt operated by the key. Sash-locks come with an angled striker keep to accommodate the latch bolt. Because the nature of the lock this style of locks has to be fitted with handles or door knobs. The mortice deadlock is like a cut down Sash-lock, in that there is no latch bolt just a deadbolt operated by a key. Unlike the Sash-lock Mortice Deadlocks do not require a set of handles and present only the keyhole escutcheon externally. Deadlocks use a box keep. Worn or badly cut keys which work at first but can cause damage to the levers. Rotated shroud, the symptom of which is not being able to fully insert the key. This fault is often caused by a broken or worn retaining spring or someone trying to open the lock with the wrong key. Misaligned bolt/keep through time a wooden door may drop along the edge. This causes the bolt to rub on the bottom edge of the keep causing difficulty turning the key and placing stress on the lock which can lead to jammed keys and lock failure. A broken key jamming the lock. This fault usually happens in the locked position and you'll need a locksmith with the correct tools to extract the broken part of key and open the door. In most of these incidents the key can be extracted without further lock damage. As a general rule of thumb if you detect a problem either locking or unlocking a mortice lock, take action and seek advice from a professional locksmith. 50% of people locked out are aware of issues with the lock but choose to ignore it end up locked out of their property usually at a most inconvenient time. WHICH LEVEL OF SECURITY DO YOU NEED? 3 LEVER, 5 LEVER OR 5 LEVER BRITISH STANDARD? The fact that mortice locks are installed IN the door and the striker/keep is installed IN the door jamb, instantly gives mortice locks the strength advantage over surface mounted locks. In fact we often see British Standard locks withstand attack and remain functional while the wooden door or jamb has split and cracked. Like so many items of hardware the higher quality and more secure lock will cost more than lower quality less secure locks. Although lower quality locks' lock-cases may look the same to the layman, they offer varying levels of security. Here is a brief description of the most common types. as the name describes the 3 lever security means keys for these locks offer less permutations for unique keys We have dealt with cases where Clients can open these locks using a random Mortice key. These locks tend not to have an anti-pick shroud therefore are relatively easy to pick. The bolt in these locks are smaller usually around 14mmx20mm The bold don't have anti-saw bars. 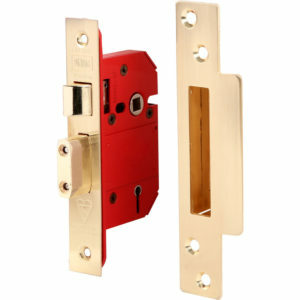 The keep for these locks consists a light weight pressed metal frame with no box. These locks are designed for light security applications such as internal or cupboard doors. 3 lever locks are NOT insurance compliant and should not be used in external final exit doors. 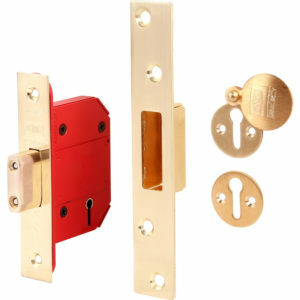 these are a halfway compromise between 3 lever and British Standard locks. 5 lever mortices give the greater key permutations. These locks have a larger bolt sometimes with anti-saw bars. They have sometimes come with a box keep which tend to be small and are using light weight metal. Non British Standard 5 lever locks are NOT insurance compliant and should not be used in external final exit doors. Common applications for this type of door would be outbuildings, Garage rear door or inner vestibule doors. this is the insurance approved standard. Most insurance policies have a section in the Terms and Conditions that outline the minimum level of security for the policy. For wooden doors they have a clause “all final exit doors should be fitted with at least one BS:3621 5 lever mortice lock." British standard Mortice locks are clearly identified having the BS:3621 number and kite mark stamped on the faceplate of the lock. The BS lock has an anti-pick shroud, a Lock case armoured with anti-drill plates, a large 20mm deep bolt reinforced with harden steel anti-saw bars and a full bodied steel keep. CHUBB MORTICE LOCKS were one of the first and most successful brands of this kind of lock. So much so people often refer to their mortice as a “Chubb lock”. Chubb locks - particularly the 3G110 and 3G114 mortice - have their own unique case profiles. Where all other brands standardised around 64mm and 76mm cases, Chubb locks do not. This means once a door has been cut for a Chubb any replacements have to be Chubb to avoid the problems of case size and keyhole position. In August 2000 Chubb was bought over by the ASSA ABLOY group who own a number of brands such as Yale and Union locks. Today Chubb mainly deal in high end security systems and their legacy locks are rebranded under the union lock banner.